Large house, with plenty of room to spread out. Two Master Queen Suites, each with an adjoining bath with tub/shower combo. There is one BR with a full bed, and another with 1 full & 1 twin bed. The third bath has a tub shower combo as well. There are TV's in every bedroom, and both living rooms. The Kitchen is fully equipped with everything you will need to stay in and cook.The large screened in porch is great for reading, gathering and relaxing and has a picnic table that will seat 8. A large island separates the kitchen and spacious dining room. The living room has 2 recliners, love seat, and a queen size sofa sleeper There is plenty of room for watching TV, playing games and spending time with your family. The house is easily accessible from the South Gate. The house is on a quiet dead end street which makes it safer for the kids to play and we have a wonderful view of Magnolia Lake. There is plenty of decking for grilling and sunning or just hanging out. You will need to furnish your own linens(sheets and towels), bath soaps, clothes detergent, and paper products. I do have some kitchen towels and wash cloths. Dish detergent, and all cleaning supplies are furnished. All guests must abide by Ocean Lakes rules and regulations. No graduation parties, spring breakers or other non-family groups. We have a no smoking and no pets policy. Minimum age of primary renter is 25. Express Check-in passes will help you avoid the lines at the office. Ocean Lakes charges $10.00 per day per vehicle to enter the resort. WE DO NOT PROVIDE A GOLF CART. They are available for rent through Ocean Lakes. Rental is Saturday to Saturday during peak season and nightly off season with a two night minimum . Keywords: Beach bungalow, house, cottage, Mobile Home with additions, one level, large screened porch & deck , lake view, 5 min. walk to the beach, close to beach, pools, snack bar, and rec center! Rodney & I have always hoped for a place at the beach. We Love to travel but are unable to get away as much as we would like because we both work full time. We enjoy spending time with our family, We have 3 sons, and 3 grandchildren. My husband loves golfing and all sports and we try to stay active. We both prefer a lazy, relaxing vacation, with a little adventure sprinkled in. One of our favorite things to do together is have our Sunday morning coffee and pour over the newspaper together. Everybody loves Ocean Lakes! We always see someone we know and our children enjoy meeting their friends while on vacation. We wanted a place that we could enjoy now and be able to stay for extended visits when we retire. We love Ocean Lakes because it's on the beachfront and the grounds are beautiful. The property is gated and the Ocean Lakes staff does a great job of keeping the park patrolled and I feel very secure at all times. The new water park is absolutely amazing! When you visit Ocean Lakes there's no need to leave because everything you could ever need is inside the park. We love the convenience of the Sandy Mart and snack shop, the Water Park, and all the planned activities for the children and adults. But if you choose to venture out, you can find all the shopping, night life, dining and attractions of Myrtle Beach right outside the gate. We love the location of our home. Our unit is a straight shot down the South Gate entrance on Coquina Dr, only about 3/10ths of a mile to the beach, even closer to the Water Park. We are situated almost center park right off Magnolia Lake. We love waking up to chirping birds, drinking our coffee out on the deck and enjoying the beautiful lake view. There is plenty of room in the back yard to play corn hole and plenty of room for parking. 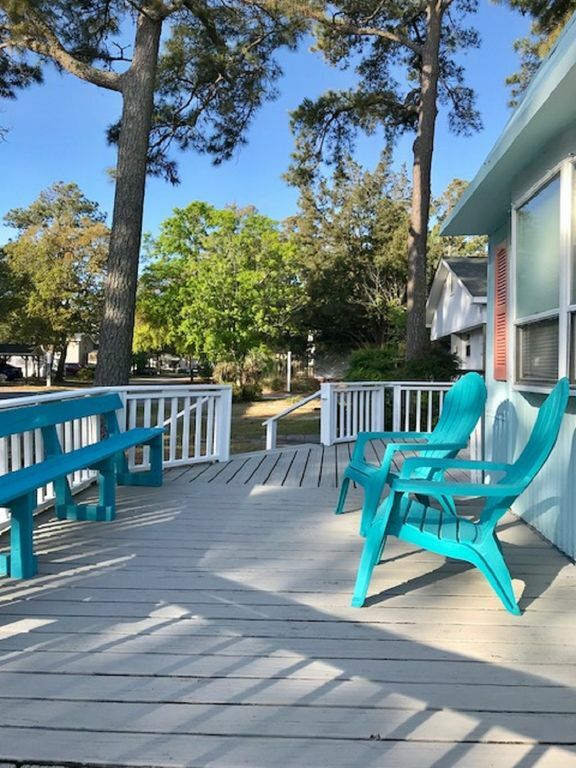 We are centrally located within Ocean Lakes campground with only a 5 minute walk to the ocean or water park. Dining table seats 6. Bar seats 2. We provide 2 additional folding chairs to pull up to table. There is also a picnic table on the screened porch that can seat up to 8 people. (2) Heated Indoor and large outdoor with kids splash zone water park, lazy river and 2 awesome water slides! Ocean Lakes provides 24 Hour Security at the entrance and on the entire resort for a safe family environment. The water park includes an outdoor olympic sized pool, heated indoor pool, kiddie pools, kids splash zone, lazy river and two awesome water slides. There are 3 snack bars inside the grounds, 8 freshwater lakes, golfcart and bike rentals, large grocery store and gift shop, 18 hole mini-golf, book exchange library, Wi-Fi areas, and much more! You can get anything you need without having to leave, but you will want to go 8 miles south to Murrells Inlet for some great seafood and to walk the Marsh Walk along the water.! What a beautiful sight! You ladies will probably want to do some shopping at Grand Coastal Mall or Broadway at the Beach or one of the two Tanger Outlet Malls and the guys might want to play golf at the many beautiful area courses. Perfect place, plenty of room. Super comfy, very homey. We enjoyed our stay so much and there was so much to do so very close by. Don’t have to leave the premises unless you just want to. We will definitely be back. This is a wonderful place to stay! Had a group of 10 people and had plenty of room. So much things to do! We will definitely come back! Plenty of rooom, close to the beach and swimming pool,we loved it!! We enjoyed out stay at the Mc Ginnis property. We were on a dead end by the lake, very quiet and safe for children to play. The home was spacious for 10 of us. We enjoyed the screened in deck as well as the open deck. Very clean and comfortable beds. The kitchen was roomy as well as the dining area. We were within walking distance to the beach (5 minutes). My family agreed that we would stay there again. Kim was nice to deal with. Very nice corner lot with a view of the lake. Wonderful space. Looks can be deceiving, as this place is very spacious with 4 bedrooms and 3 baths, a full living room, sitting room, dining room and kitchen. The sunroom was wonderful. We truly enjoyed our stay and hope to stay here again with family and friends. Nice, clean and spacious. Love the screened in porch, nice for drinking early morning coffee. No odd smells. By far the best house I’ve stayed at in Ocean Lakes. Thank you so much for your kind comments. We love our place too! It was a pleasure having you as a guest and we hope that you will consider us on your next stay at Ocean Lakes!